The holiday season is undeniably known for food–its power to bring people together, to make memories, to share traditions, and make mere ingredients into something much more special with a little creativity. In that spirit, we’re happy to announce our One Book, One Mesa County selection for 2016. 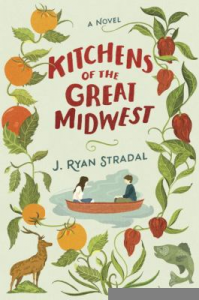 Kitchens of the Great Midwest, author J. Ryan Stradal’s debut novel, tells the story of one spirited chef’s nontraditional rise in the culinary world through several narrators’ perspectives. The child of a chef and sommelier, Eva was, from the earliest imaginable beginning, passionately introduced to the food world. Her journey to super stardom is told in a series of related stories, each chapter introducing new characters, ingredients, and insights to Eva’s inspirations. The book’s format is unexpected; its protagonist, quirky and strong; its setting, entirely Midwestern; and its topics–even to the non-foodie, are relatable, comforting, and captivating. You’re as likely to find yourself laughing as to find yourself hungry. The One Book committee is delighted to be hosting J. Ryan Stradal in March 2016. All One Book events and programs will be announced in January. Place a hold on a library copy today! We look forward to seeing you in our audience soon. Posted in One Book, One Mesa County.